Great Clips makes it fast. The grass is green. The Lonnie Chisenhall Era begins in earnest on opening day in Cincinnati. 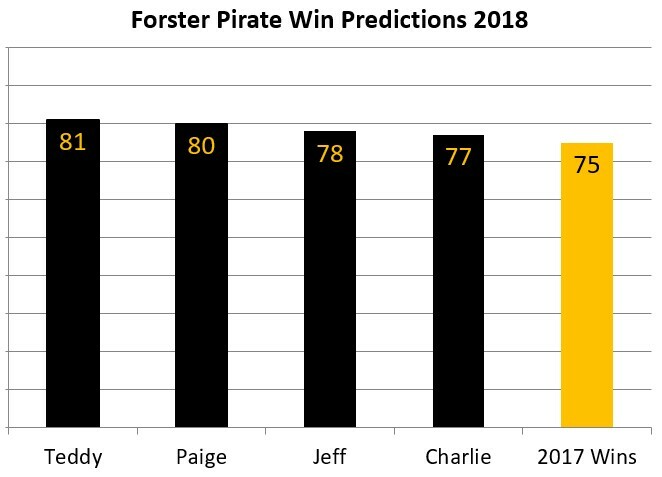 It's time for the Forsters to predict the Pirates' fortunes for the coming year. Teddy, being the most optimistic last year, predicted 81 wins, and the boys of three rivers summer beat that out by winning 82 games. Due to a meaningless rainout of a late season clash with the Marlins that was not rescheduled, they only lost 79 games for a memorable .509 winning percentage. This year, Charlie believes the most, and I am back to being the pessimist of the bunch. In Kyle Crick we trust! It's pretty far into the year to look back at last year, but better late than never. It was a grand reading year for me, and I have several titles to recommend. I read this fantastic book in a most unusual fashion for me. Essentially in one sitting. We were flying back to Pittsburgh from Washington state, where we'd been on vacation. I'd just barely started the book - I believe I was still on the introduction - when what was to be a 75-minute layover in Dallas turned into 3.5-hour lightning delay. At the gate, I set to reading the book and found that I was gobbling up pages quickly. The infotainment on the flight consisted of free wifi if you downloaded the American Airlines app. By then, I was well into the book, and I just kept reading. I finished the book in bed after we arrived home at 2:30 in the morning. So, sort of one sitting. It's terrific. I heard Murphy interviewed on Fresh Air. He confesses in the book that he's always had a crush on Terri Gross's voice and because she asks interesting guests interesting questions. 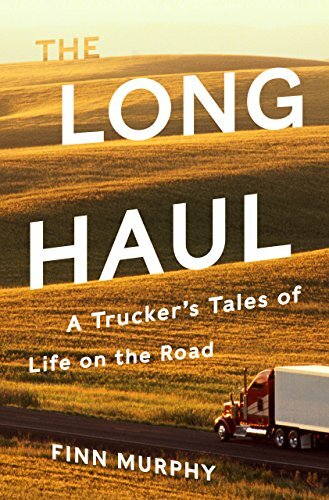 He's a long-haul mover of the high-end executive type, and he just describes how he got into that field in the first place, what it's given him, what it's barred him from, and the interesting things that have happened to him over a decades-long career. He was basically an educated middle-class guy who decided that a job job was not going to be for him and that manual labor wasn't all bad. I loved it. It made the whole travel nightmare feel like a boon. Brubaker Bradley does it again. 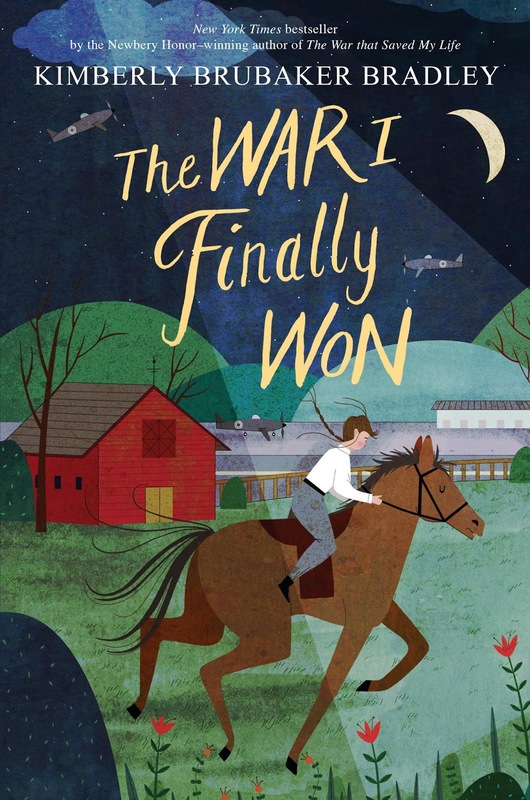 She followed up The War that Saved My Life, a book we read as a family last year, with The War I Finally Won. We did the same with the sequel. This book continues the story of Ada and Jamie, two kids subjected to different levels of abuse by a low-resource barmaid in London. Ada is the emotional heart of the two books, and I'm very impressed with how Brubaker Bradley depicts the uneven path of a child recovering from trauma and trying to learn how to trust people and situations more. Her characters surprise the reader in nuanced portraits of evolving behavior. The books may be accused of anachronistically infusing current social and political mores into World War 2-era England (town and country), but I admit to rooting for that more often than not when it happens in these stories. And she's not alone. Exhibit A: Downton Abbey. If there's a theme in these two books, it is empathy in some people overcoming its lack in others. Our whole family, with boys aged 15 and 11 at the time, have been completely engaged by the storytelling. 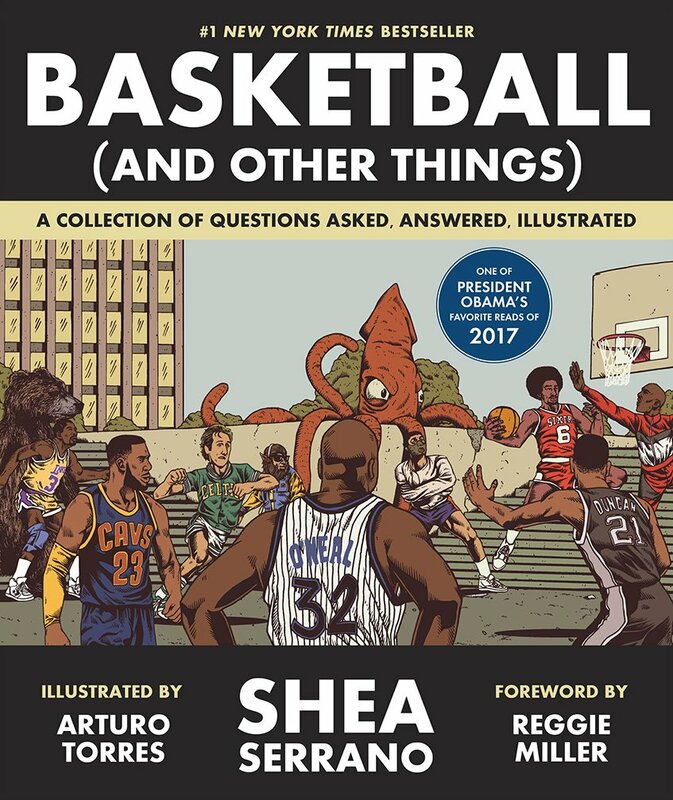 I heard Brian Koppelman talk about this book on Bill Simmons's podcast, and he said something like he'd given it away to 30 people. On my list, it went, and I'm glad it did. Benioff is the opposite of prolific. This is his third and final book, and it was written ten years ago. He is now a Game of Thrones show-runner. 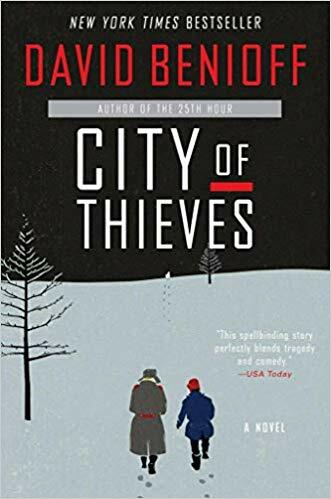 City of Thieves throws together unlikely groups of people during the siege of Leningrad in World War II. Two in particular go on a surprising quest together. To say more would be to ruin the story, which is prodigiously page-turning. The setting is educational without feeling like it. The characters and plot are a little over-the-top and cinematic, but guess what? I like movies. A book that reads like a movie is fine by me. It's a terrific novel. Everyone loves to review books they enjoyed, and that's great. It may be a greater service reader-to-reader in these times of so much content and so little time to say: don't bother with this title. Friends don't let friends.... So here goes: some books that bummed me out in 2018. I don't remember how this book got on my list, but it was on my competent wife's list, too. I do know that fictional saints Meg Wolitzer and Ann Patchett blurbed it. I don't know why. It's a good yarn, I suppose, told in a theoretically realist fictional fashion. The problem is that characters don't behave in a realistic fashion. There's a level of violence that becomes literally unbelievable. Literally. I don't mean it's a lot of violence or more than one might expect. I mean that I don't believe people actually live lives that are that violent or that if they set out to do so, they wouldn't live as long as the titular protagonist does. It's not giving away too much to say that the "twelve lives" refer to this character surviving twelve bullets. Come on. Also, his dark and murky life of crime stretches credulity. The family story that gets told in inverted order is somewhat interesting, but there are too many distractions. Too many characters who emerge from a plot smoke machine. There's enough plot teasing to keep even a reader who came to hate this book as much as I did reading in order to see where the teases lead. Begrudgingly, I can give Ms. Tinti that. But wait! There's more to dislike. The omniscient narrator turns seriously omniscient - nay, pedantic - on all manner of topics: constellations, whales, dyeing and weaving yarn, fishing, first aid. This is an author who knows how to do the work of research but lacks either the skill or the will to weave it in without announcing "I did some research!" Tiresome in the extreme. Don't waste any of your one life on these twelve. There's a lot about this book that I seriously disliked. I'm not talking about the writing yet. I'm talking about the physical object. 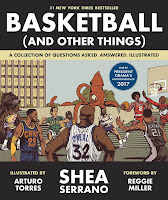 The book collects Internet-column-style essays about NBA basketball written by someone with a level of basketball junkie-ness that I can appreciate. Serrano worked at Grantland with Bill Simmons and now works for The Ringer, his HBO-backed multimedia sports and culture empire. To supplement the essays, there are lush drawings by Arturo Torres. Many of them are cool and evocative. The thing is: the soft cover book is printed on square, heavy paper to support the drawings. I mostly read in bed. Heavy, oversized paper with a soft cover means that the heavy book flops and drops when trying to read it in a reclined position. Fault 1. Also, every fifth page or so is printed on a page that is covered completely in an often-dark color. Who commits this kind of crime against legibility? Shea Serrano, Arturo Torres and the Abrams Image corporation. Fault 2. Finally, a combo platter: the font of the main text of the book is pretty damn small, and then Serrano fleshes out or clarifies points in a lot of footnotes. Footnotes can be cute or helpful, but when they are adding to what is already an illegible, physically difficult book, they're just annoying. Fault 3. Now, to the content. Too cute by half. The thing about Internet opinion pieces is that they’re usually meant as quick hits, to be easily consumed on a screen. Also, they should have arguments or ideas that make people want to share and/or argue over them. Serrano's essays have many of those features but not the brevity. They can be dense, and their cuteness wears thin. He writes in a very self-conscious way at points that I would classify in the Lena Dunham Millennial vomit-inducing category if that weren't such a broad and negative brush. Any collection of essays will have winners and losers. You may not be surprised to know that the essay formed on the premise "Who would do better if you swapped their environment? Karl Malone or a bear?" drove me absolutely batshit crazy. It doesn't help that I read the majority of this book while marooned in my bed suffering through and recovering from the flu. But actually, I'm pretty sure I would have been just as angry and dismissive if I'd been well while reading it. The book may have induced the illness. It's opening day, and the Pirates are in first place. There's still a little snow on the ground. All is possibility. The McCutchen era is over. No one in our family believes the Pirates can have a winning season, but everyone believes they will improve on last year's win total. Can I repeat as the most accurate predictor (a title I attained on my seventh try)? Only time will tell. Baseball! You bet! I read some good books in 2017. You should read them in 2018. And true story: a good friend pinged me for a book recommendation while I was drafting this post. 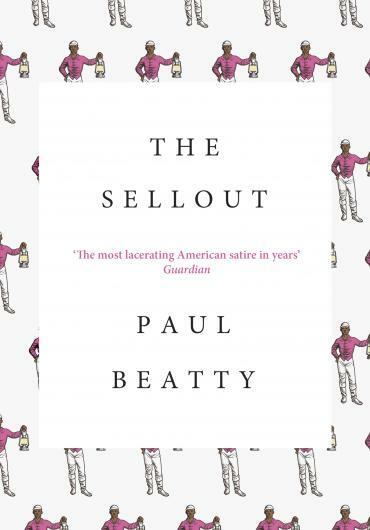 Marc Maron had Paul Beatty on his podcast and raved about The Sellout without managing to describe it. Having read it, I now understand why. 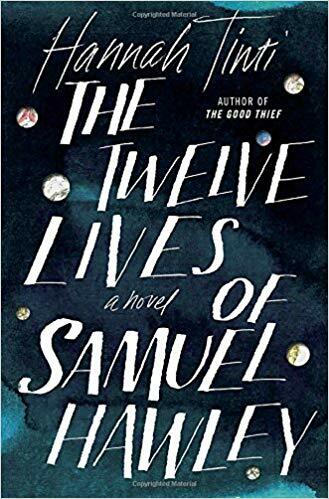 This novel is a work of towering satirical genius and social commentary on race whose pages are as crammed with details, ideas, and references as James Joyce's Ulysses. Early in my reading of the book, I found it took a lot of energy to focus and read it, especially at bedtime. I noticed a woman reading it in the park near my office and chanced to interrupt her reading and ask her whether it was worth continuing. She immediately said yes, and I used this stranger's reassurance to soldier on. I'm glad I did. The Sellout is set in a fictional all-black submunicipality of Los Angeles where the eccentric protagonist was raised by an arguably-more-eccentric single father. From a whole vein devoted to a character from the Little Rascals to a sly reference to David Sedaris, the book ranges far to depict, confront, and - perhaps most surprisingly - have fun with racial identity. I loved it, and I'm happy I had the guts to ask a stranger in the park a book question. 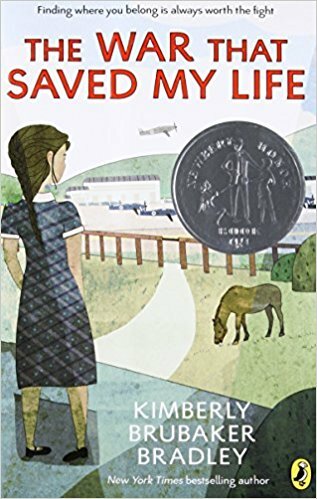 We read this book for family reading (which we still do with our busy teenage and pre-teen son), and I sometimes had to pass it on to someone else in the family to read because I got too choked up. 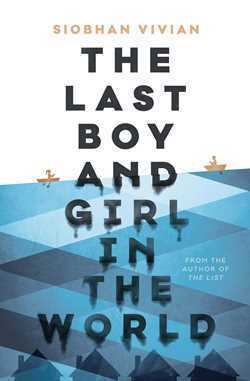 The novel tells the story of Ada and her brother Jamie, who get evacuated from war-threatened London to a small town in the English countryside. 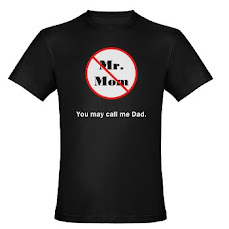 Their mother is an abusive moron barmaid. Ada has a club foot and is not allowed to leave their apartment. Though the welcome is not always warm in the countryside, their evacuation achieves the goal of saving them from the violence of war. There are worse fates than war, though, and the evacuation plays a role there, too. The children are taken in by a gruff woman named Susan, whose stiff-upper-lip practical care reminded me so frequently of my mother-in-law. It's a touching story that the whole family enjoyed. If I honestly record that it took me a calendar year to finish this book, you might think I didn't like it very much. Far from the truth. I pulled this book off the shelf of my friend Karen Dreyer, for whose maternity leave I was filling in at the Greater Pittsburgh Community Food Bank. She'd read it with her staff in the Southwestern Pennylvania Food Security Partnership. During my brief tenure there, I read about 30 pages of the book during downtime. 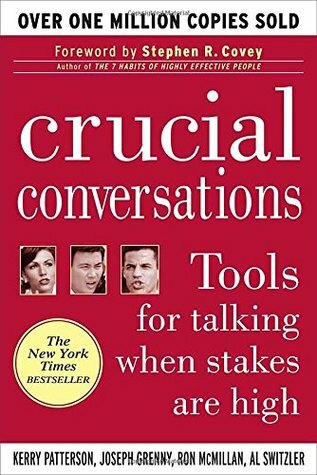 By then, I was hooked on this practical guide to avoiding the kinds of traps that too easily happen in high-stakes conversations at work and at home. The big theme is that all participants in a conversation should add to a pool of shared meaning. If anyone is doing things other than that - for instance, silence of violence - the conversation isn't succeeding. The authors describe well the many ways that conversations break down. They also prescribe ways to spot our own failings and move conversations back to productivity. 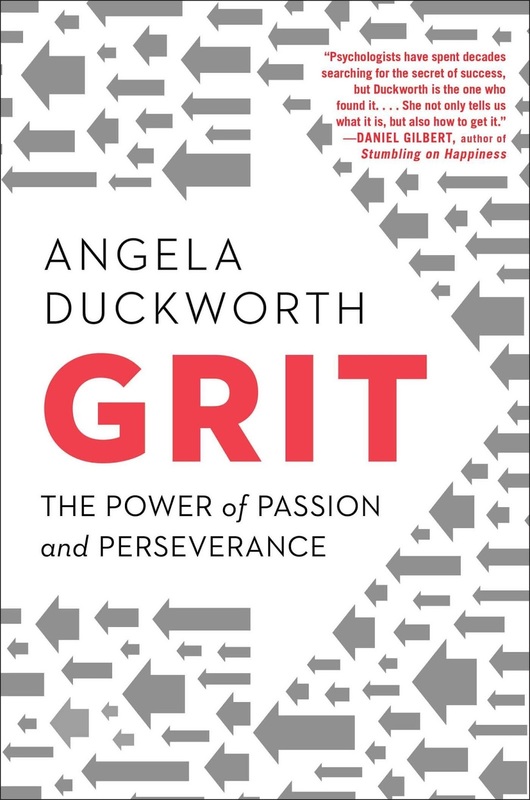 I finished it in bits and pieces over the busy first nine months of my job at Truefit and found it valuable in my professional and personal life.